After a night of desert shenanigans involving flaming Roman candles a few weeks ago my favorite North Face puffer jacket is in need of some light repair. Thank the gear gods for Tenacious Tape. This stuff is like gold on and off the trail! 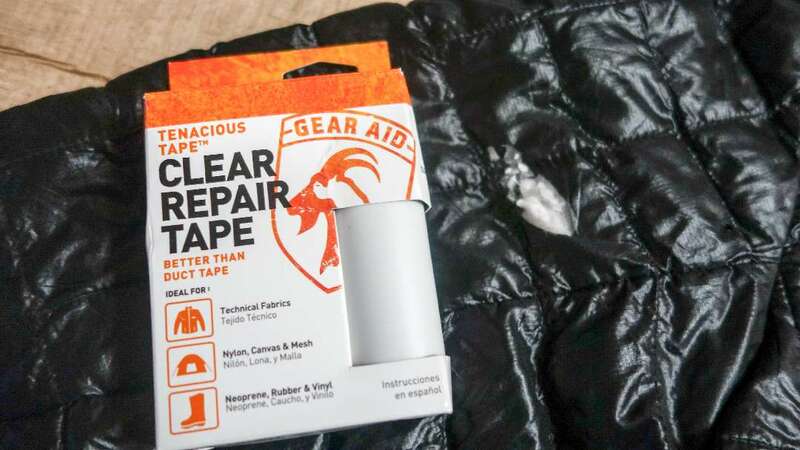 In this quick “how-to,” I’ll show you how to repair a puffer jacket, or any piece of fabric gear for that matter, in three easy steps. Using your scissors, cut out a patch of Tenacious Tape that’s slightly larger than the hole you are going to repair. It should have about 1/4 inch overlap or so on all sides. Round off any sharp corners or edges on the patch. This will keep the edges of the tape from accidentally catching on things that can rip your patch off. Pull the backing off the tape and place your patch over the hole. Apply pressure to the patch, working from the center out to remove any air bubbles. That’s it! You’re jacket is good as new… or at least as close as you can get it without sending it back to the manufacturer or doing some really fancy needlework. Allow the patch to set for a while before washing and the repair should last for years to come. Have you got a repair tip you’d like to share? Let me hear about it in the comments below.